How does a lawn become compacted? How do I measure my lawn for compaction? How does aeration relieve a compacted lawn? What time of year should I aerate my lawn? Around half of the volume of a healthy soil is gaps and channels. These channels allow air and moisture to pass down into the soil, allowing it to “breathe”. These channels promote the growth of bacteria and other beneficial organisms. They also give the roots of the grass space to grow. Compaction is the act of compressing the soil so that the gaps are no longer there. This squeezing reduces the amount of air and moisture that the soil can hold. Compaction suffocates the soil, and the grass suffers as a result. Why does the soil need to breathe? Like us, bacteria, worms and other organisms in your soil need access to air and water to survive. They live within the soil, and so the soil must have a way for these organisms to access these elements. A compacted soil is much more dense than a healthy soil, so it has no space to hold moisture and air. The organisms that contribute to a healthy soil ecosystem, struggle to survive. The soil “dies”. 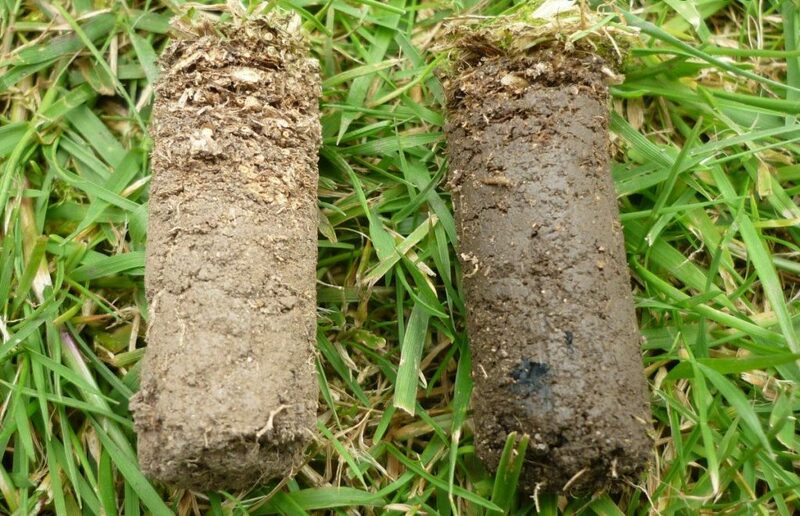 Two soil cores taken from a lawn on the same day. The right one looks normal and contains plenty of moisture, the left one is compacted and totally dry. A healthy soil is the key to a healthy lawn, so it is very important to manage how compacted your lawn is. Clay soils do tend to compact more easily than sandy soils. This is because the particles of clay are much smaller than sand or loam. They can bind together in a dense pattern and stick together. 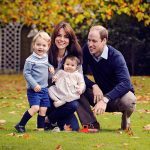 A typical British family enjoying their lawn. 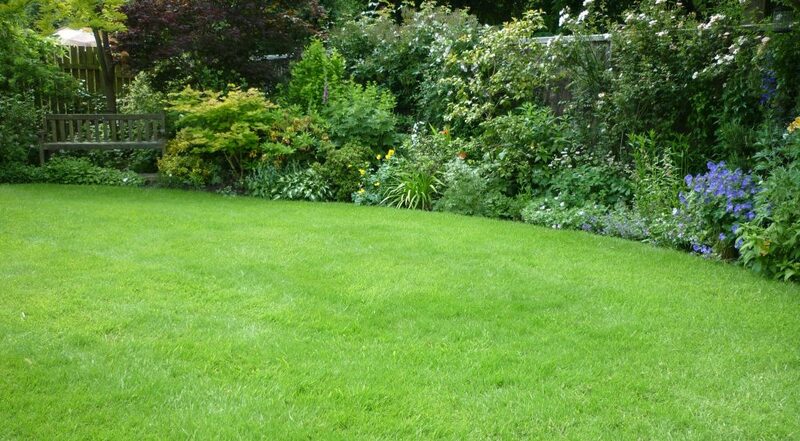 The most common reason that a lawn becomes compacted is through use. Mowing, playing football and a family barbecue all contribute to the particles compacting. This problem becomes worse if the soil is wet. Air becomes forced out and does not get replaced. The soil will dry out without containing any air pockets. Even if you don’t use your lawn that much, over time it does become compacted. This happens through rain fall, increase in root mass and gravity. How does a compacted lawn affect the grass? Healthy grass needs a deep, thriving root system to do well. This enables the plants to absorb more nutrients out of the soil and to help it to reach water that is deeper down. A deep root system also gives the plant great stability. Healthy grass needs a deep, thriving root system to do well. A deep root system also gives the plant great stability. The grass will be able to tolerate droughts and fight off disease. It will also repair itself from damage quicker. The extra root system acts as an emergency food and water store for the grass, and with this it can stay alive during tough times. Grass that is trying to put down roots in compacted soil will be thin, weak, and will hardly grow, if at all. New seed will not germinate. The area will become thinner and weaker over time, which is far from a lush green lawn which we are all after. Some weeds thrive in compacted soil, such as greater plantain (plantago major). These will tend to dominate and crowd out your grass. The grass in your lawn will deteriorate and die. 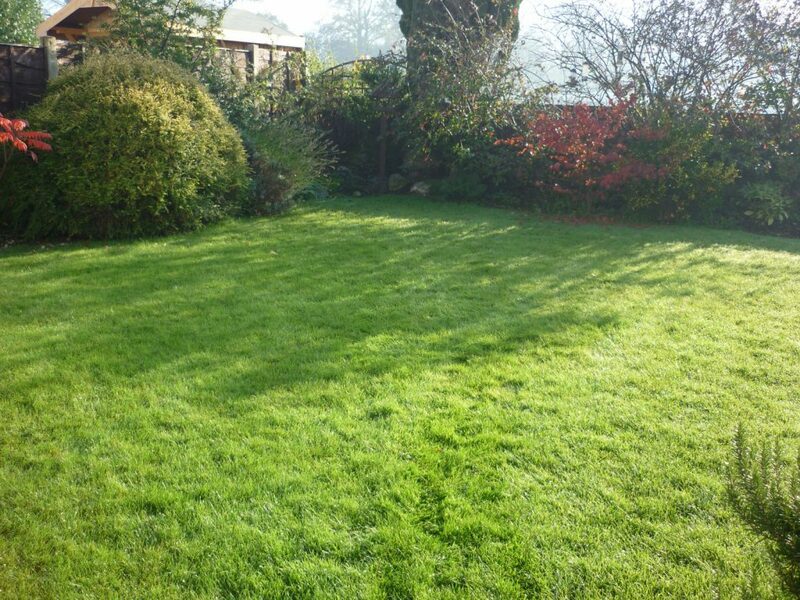 A thin, compacted lawn which is in bad need of aerating. 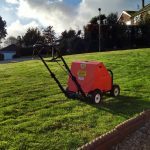 Do all lawns need aerating? All lawns enjoy an aeration treatment. From the point of view of a domestic lawn, it is not possible to aerate it too much! They will always react well with lush growth and increased vigour. 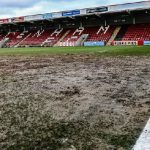 The very best premiership pitches have a spiking machine run over them after every match. It opens up the soil and aids recovery, especially in the most prone areas such as by the goal mouth. On lower league pitches, the goalmouth area always struggles top keep a good grass layer. This is because the goalie spends 90 minutes standing on it, squashing the air out of the soil. It compacts the soil and prevents the grass from being able to recover for next time. Running an aerator over this area after use prevents this and aids grass recovery. The compaction level of all lawns does vary. It can even vary between areas on a single lawn. The compaction level can differ throughout due to many reasons. Wear and tear, soil profile changes, previous use and the amount of sun or drainage can all play a part. Often, a lawn expert is able to see that changes in compaction levels from the colour and health of the grass. They can also spot compacted areas and areas which areas are doing well. This is a skill which comes with the experience of assessing hundreds of lawns. Compaction is the most common problem for lawns, but often the most overlooked! The professional way to measure the compaction level of a lawn is to use a compaction tester. This is a special tool which gives a pressure reading to the difficulty of driving a probe into the soil. The more air channels in the soil, the easier it is to spike it with the probe. All reputable lawn experts carry such a probe. 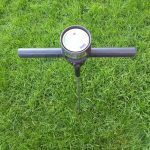 To measure the compaction level in your own lawn, the first step is to stand back and have a good look it. Select the areas which you think would be most susceptible to compaction. This can be the area near an entrance, along a path to a shed, or an area under the shade of a tree. Compaction can also be in areas of old paths or previous building foundations in the lawn. Then, using a tool with a spike on the end such as a garden fork, try to drive the fork into the ground with your boot. Do this all over different areas of the grass. If you can drive a fork in at least six inches using only a small amount of weight, you don’t have a compaction problem. For most lawns, this is what we are after. Unfortunately, this is very rare indeed! 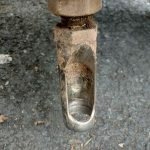 If you can drive the fork in, but have to use a significant amount of weight behind it, then your lawn needs aerating. Sometimes it is almost impossible to penetrate even the top surface of the lawn as it is far too hard. 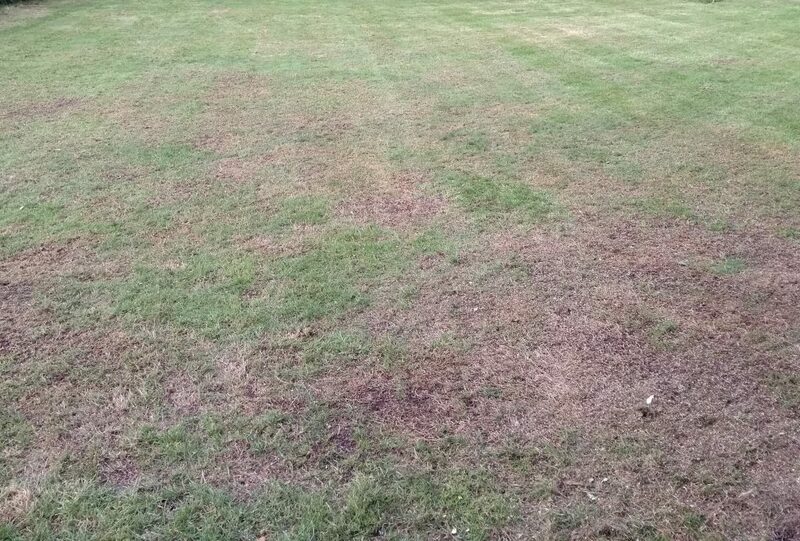 If you find that this is your lawn, then you need an aeration treatment. It will most likely need repeating within the next six months to get it back to a usable state! How do I prevent compaction? The best way to keep lawn compaction under control is to aerate your lawn on a regular basis. This will prevent compaction from becoming a problem. Not only is it much easier this way, but it will keep the grass fresher. Healthy soil will also drain faster, prevent thinning and be home to a beautiful, healthy lawn. I recommend hollow core aerating your lawn at least once every two years to keep compaction at bay. An aeration treatment uses a heavy machine to punch thousands of holes into the surface of a lawn. These holes create space in the soil. The soil then “relaxes” into this space, allowing more room for air and water to penetrate the soil. This process promotes vigorous grass root growth, as they are able to drive deeper into the soil. A good root system is the foundation of a great lawn. The results of an aeration treatment can be dramatic. Solid tine aeration (sometimes called spiking) uses solid metal spikes. These drill a simple hole into the lawn. Hollow tine aeration uses machined tube which removes a “core” of soil. This core is usually around two centimetres in diameter (up to 1 inch) and up to ten centimetres deep (3 inches). There are also slit tine and fracture tines. These are also used to relieve compaction in different ways. These are used more often on professional sports pitches. Often, the speed and quality of the improvement in the lawn is surprising. Sometimes it makes more of an impression than a fertilisation treatment. The grass may have all the right nutrients in the soil, but if the roots have no space the grass plant will struggle. Aeration can be the bridge between an average lawn, and a fantastic lawn you are proud of. Aeration should be the first step in bringing an old lawn back to its best. Compaction should be the first problem to look for when diagnosing lawn problems. Solving a compacted soil will see a solution to many other problems in the lawn. Moss will reduce, the grass will be stronger and resist disease and it will be greener. This pleasing lawn looked great all year round. This picture was taken in autumn and the well aerated soil meant the grass stayed looking brilliant. You can undertake a basic lawn aeration can by hand using a manual aeration tool, or a garden fork. But this is difficult and time consuming. Many folk I speak to express frustration at the poor quality of the tools available. They clog and break. Using a garden fork is very difficult. Manual aeration is only practical on the very smallest of lawns. To aerate your lawn well, you need to use an aeration machine. These machines drive tines into the ground using their weight. Even small domestic aeration machines need to weigh the best part of 100kg to be effective! This all means that the priority for deciding when to aerate your lawn rests on the condition of the soil. The soil needs to be able to withstand the weight of the machine without damaging its structure. Or compacting it even more. Whether you can aerate depends on the condition of the soil! If the lawn is too wet, then the machine will drive the air out of the soil, and make trenches with its wheels. This will cause the lawn to become uneven and compacted, damaging the grass and undoing the good work. If the lawn is too hard, say from drought, then it may be impossible for the tines to penetrate the soil. The machine will “walk” over the surface! It is also inadvisable to aerate your lawn during a frost. The wheels of the machine will snap the grass leaves, breaking the cell walls, killing the leaves. 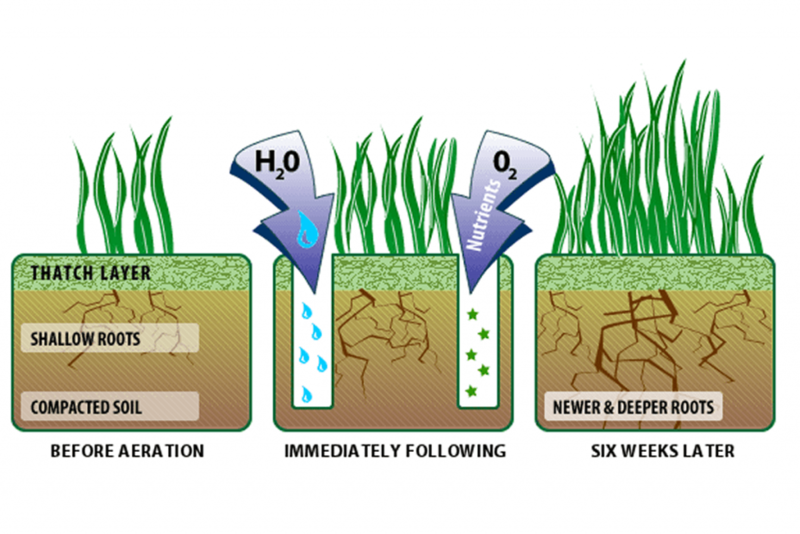 An aeration treatment is most effective when the soil is moist underneath, but dry on the surface. Consider combining aeration with fertilisation! Aeration is great for opening up the soil and allowing moisture down to the roots. If you time it well, you can gain extra benefit and combine it with a regular fertilisation treatment. This will reduce any surface run off and draw the feed and nutrients down to the roots much quicker. The lawn improvement from a combined aeration and fertilisation treatment will be dramatic. Grass will expand its roots in the soil and the fertilisation will encourage new top growth. This will see rapid, lush growth appear. The lawn will build tolerance to drought and become much more hard wearing. An aeration treatment is one of the very best treatments you can do to any lawn. The best months of the year to aerate your lawn, to gain the best effect would be in the spring or autumn. You can then combine it with an appropriate fertilisation treatment. But, if the situation in your lawn is critical (i.e. it is very compacted), treat it at the first available opportunity. 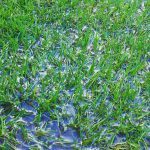 Aerate it as soon as the environmental conditions are correct. On a compacted lawn, aeration is a priority! I aerate lawns all year round, scheduling it for the best time for the particular lawn in question. Should I hollow, solid, slit or fracture-tine the lawn? So you have decided that you have a compacted lawn and need to treat it with an aeration treatment. But what sort of tines should you use to aerate it? Solid tine aeration is driving sharp metal spikes into the surface of your lawn. they make simple holes. These holes can be quite deep, up to six inches or sometimes more. They are the simplest way of helping to relieve minor compaction issues. They also and help to refresh a tired lawn. I recommend solid-tine aeration for lawns which only have a low-level of compaction. Lawns needing a boost from a temporary high use (such as a party) or a fine lawn that needs helping through a drought. Solid tine aerating will help water reach deep roots quicker, speeding recovery. Solid-tine aerating does not actually remove any soil. They move it around. 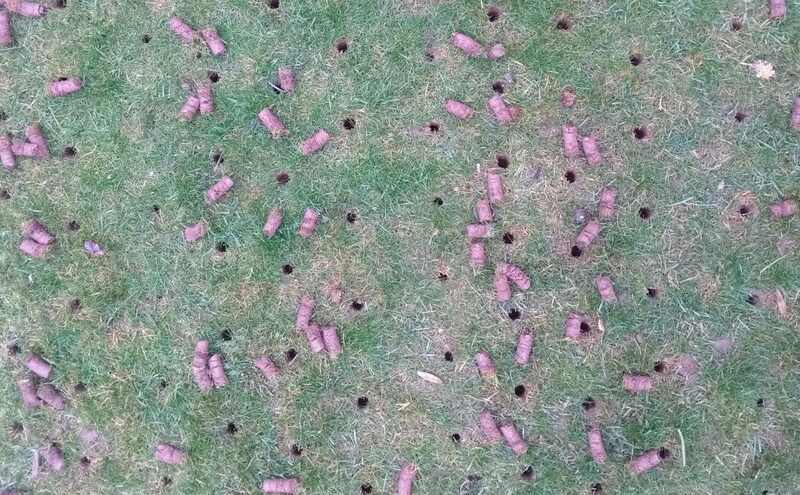 If you solid-tine aerate a compacted lawn, the holes will squeeze back together in a matter of days. It does no relieve any pressure in the soil. 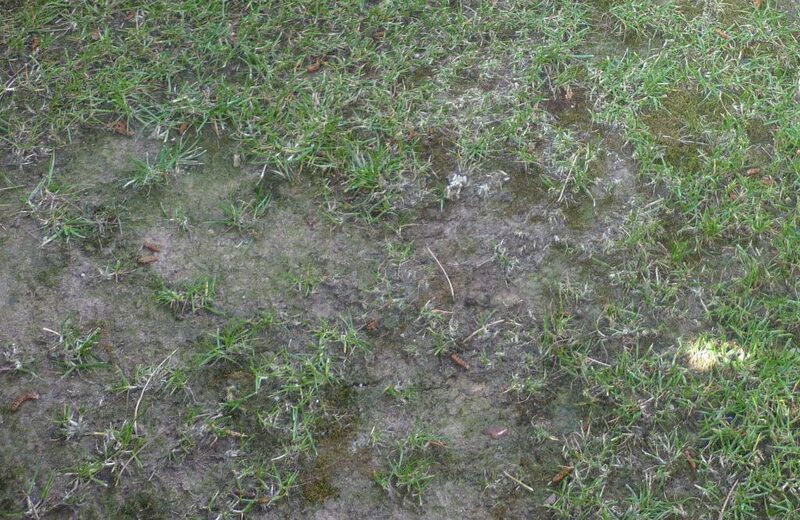 This is one of the main disadvantages of solid-tine aerating. Also, if the soil in your lawn is clay or wet, then the action of the spikes entering and leaving the soil may “smear” holes. This seals up air and water channels to the roots, hampering the main benefits of the treatment. Solid-tine aeration is a general maintenance aeration treatment for well established lawns. If you have a bad compaction problem, then hollow-tine aeration would be a better choice. 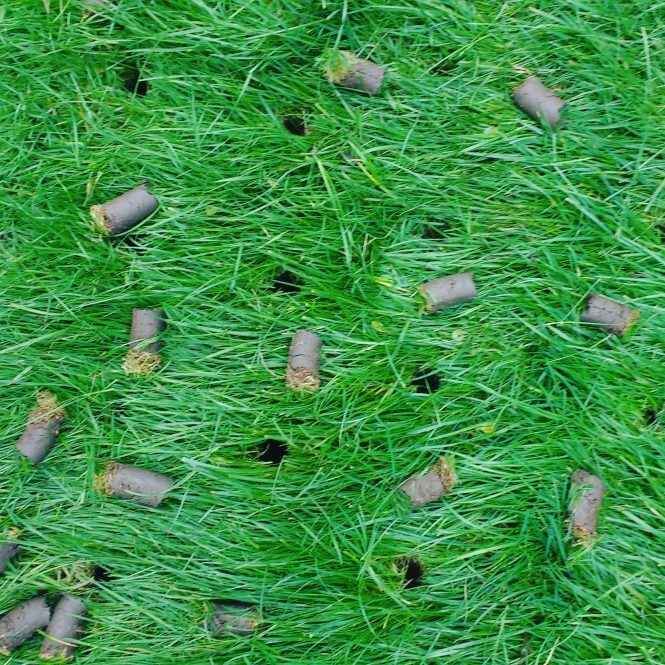 Hollow tine aeration involves driving metal “tubes” into the surface of your lawn. This extracts a core of turf and soil. These are generally not as deep as solid-tine aeration holes, usually about three inches or so. The main benefit of removing a core of soil is that it creates extra space in the remaining soil. This allows the lawn to relax and for the pores in the soil to open. The effect of hollow-tine aeration is much more long-lasting. The holes can stay open for many weeks after the treatment. Roots grow and flourish, allowing the lawn to thicken and improve. Hollow-tine aeration is suitable for all lawns. It is especially effective on lawns which are very compacted or suffer a lot of wear and tear. The only problem with hollow-tine aeration is that it does produce waste cores. Removing these cores is a good idea. If you don’t they may clog your mower, bring weed seeds to the surface, and increase the level of thatch in your lawn. Removing these is time consuming, but well worth it. If you only have a small lawn you can placed them on a compost heap or added to your green waste. For larger lawns this can be a considerable amount of soil. If you cannot find anywhere in the garden to dump it (it is just soil, after all), you can dump them at your local green waste tip. Using a Pluggr PL400 aeration machine set with hollow tines. 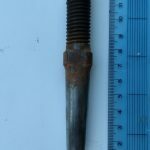 What is slit-tine or fracture tine aeration? Slit tine aerators work in a similar way to solid tine aerators. The only difference is that the tine is long and flat. This produces a slit in the turf, rather than a straight hole. The benefits if this is that it opens out the surface of the turf and cuts into the thatch layer. Like solid tining, slit tines don’t relieve compaction. They keep good quality turf look fresh and invigorated. Fracture tines are a new development in the turf industry. These machined tines, similar in profile to slit tines, go into the lawn on a cylinder. As they move through the soil they snag on the soil and break it up underneath the top surface. The produces cracks and fissures in the soil, relieving compaction without a core. Experts in lawn care like this new method of aerating. But there are few machines available offering this new method at the moment. Should I choose solid-tines or hollow-tines to aerate my lawn? 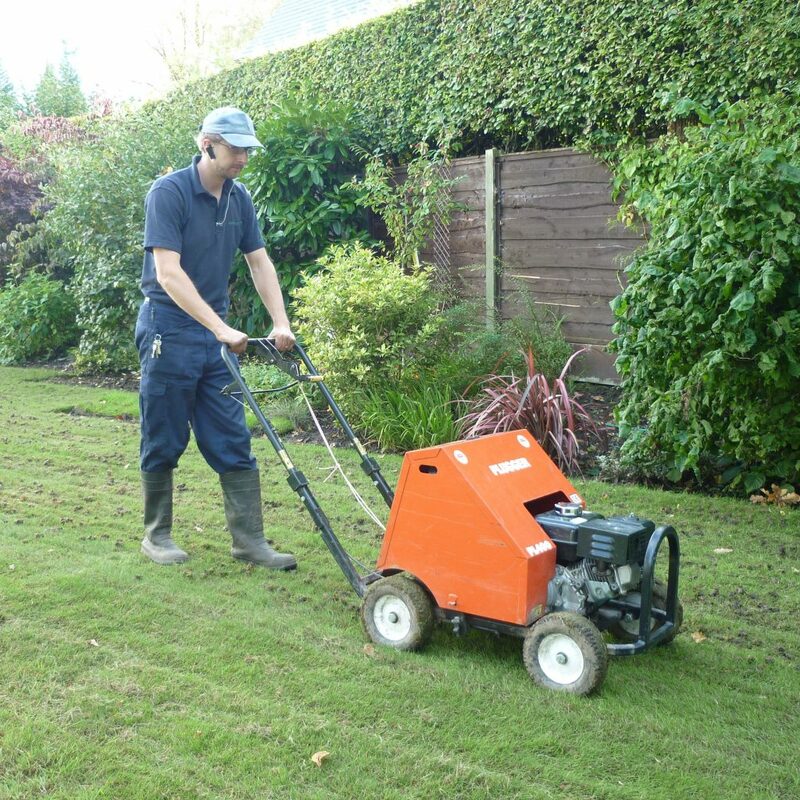 To summarise, if you have a compacted lawn, or are in doubt at all, then choose hollow-tine or fracture tine aeration. If you wish to maintain your lawn to a decent standard, then solid-tine or slit-tine aeration is often fine. Hollow-tine aeration holes made in a lawn by The Lawn Man, Devon. Briggs and Stratton – Why, how and when to aerate your lawn.